Caught your breath from Conor McGregor’s gritty majority decision win over Nate Diaz yet? UFC 202 may remain fresh in the memory, but it’s no time to reminisce with another exciting fight card coming to fruition on Saturday night. UFC on Fox: Maia vs. Condit, otherwise known as UFC on Fox 21 sees the UFC return to the Rogers Arena in Vancouver, British Columbia, Canada—only the second time a UFC on Fox card will be held outside of the USA, the other being the show which saw Anthony Johnson demolish Alexander Gustafsson in front of his fans in Stockholm, Sweden. Simply, it’s a fun card that’s perfect for a UFC on Fox event. Its 21st edition will be headlined by a classic styles mash-up featuring former interim UFC welterweight champion, and WEC’s last welterweight titleholder, Carlos Condit, taking on Brazilian jiu jitsu mastermind Demian Maia. Further down the card you have enthralling match-ups such as ex-UFC lightweight champ Anthony Pettis versus Charles Oliveira in the former’s featherweight debut, Paige VanZant’s return to the Octagon following her stint on TV show Dancing With The Stars—taking on Aussie scrapper Bec Rawlings—as well as Sam Alvey’s sure-fire barnburner against fighter-rapper hybrid Kevin Casey. However, there’s one fight that sticks out—and that could be partially due to the fact their first fight was that damn good—with Joe Lauzon looking to avenge his earlier loss to Jim Miller on Saturday night. 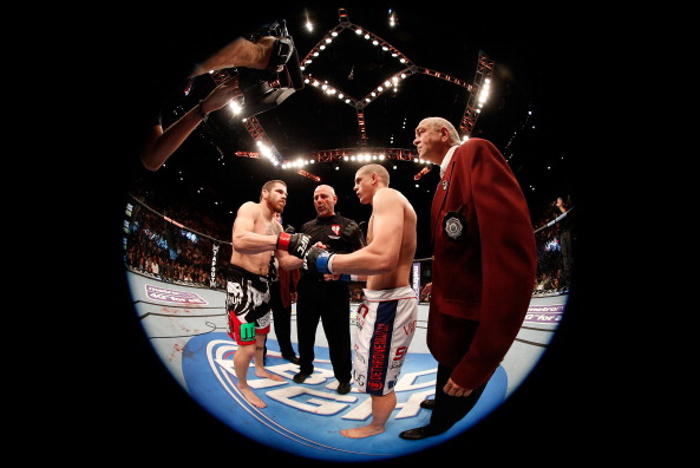 The pair’s first battle took place at UFC 155—the UFC’s end-of-year show back in 2012, earning them both Fight of the Night honors. Their respective high-level Brazilian jiu jitsu games kept the fight standing at first, which showcased both men’s willingness to slug it out in what turned into a blood-soaked war. But, their exchanges on the ground were equally thrilling later on in the fight.